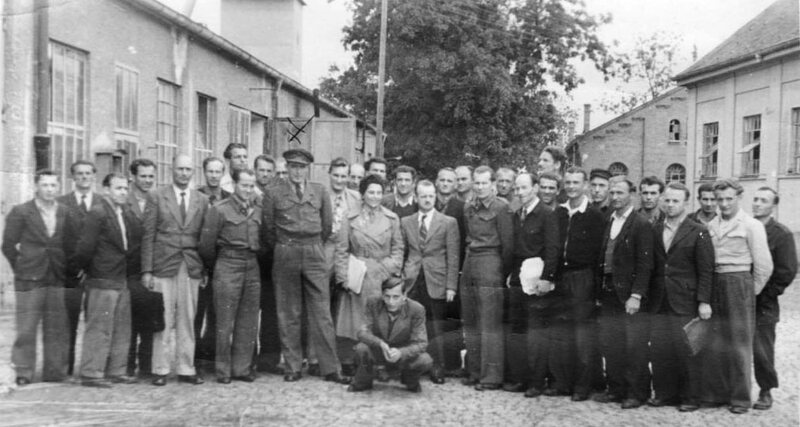 München / Munich (U.S. zone), Jews, Ukrainians, Balts, Russian Boy Scout troops in camp. Ukrainian Free Acad. 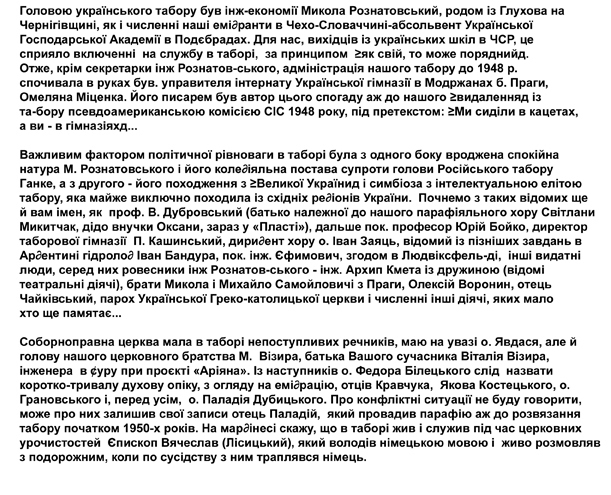 of Science & Shevchenko Scientific Society published from Munich. Prior to closing in 1947, UNRRA Univ. 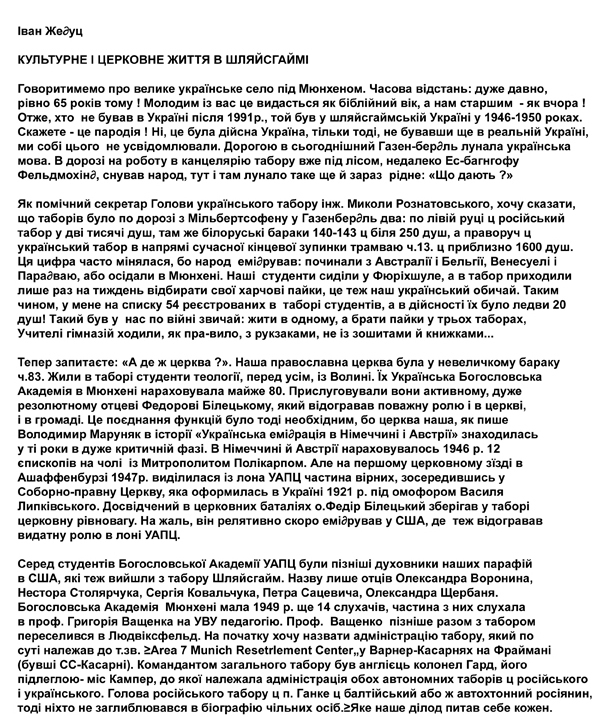 had 1,400 students (majority Ukrainian, Latvian & Poles) (Wyman, p. 125) Ukrainian Free University broke off from Harvard research team because they wanted to be identified as Ukrainians, not Russians (Wyman, P.158). Mr. Thomas W. Greenwood, after considerable experience as Transport Officer in British Zone, Germany, was transferred to the IRO Area Team 1066 on 29 September 1947 at Grade 8. With the amalgamation of Teams 1066 and 1069, Mr. Greenwood became Transport Officer of new Area 7 and on 1 April 1948 was promoted to Grade 10. At the time of his resignation (to resettle in Australia) Mr Greenwood was in charge of an organization consisting of fourteen (14) Officers and approximately 1000 employees and responsible for the operation and maintenance of approximately 600 motor vehicles, as well as rail freight transport, engaged in the logistic support of 55,000 Displaced Persons in U. S. Occupation Zone, Germany. Av. Antärtida Argentina 1355, Retiro, Buenos Aires, Argentina. Hi Olga, You can't get tired of hearing how great a service you provide. I came across this site because I am trying to gather any little tidbit of information for my husband who born in a refugee camp in Munich. We know very little, and I still do not know where to start. My husband's father was born in Translyvania, Romania, his mom, in Budapest. Their first son was born in Dauchon, but had a different dad from the following 4 boys, but we have no name. The following 4 boys were born in various refugee camps in Germany.One was born in Munich Germany. The whole family immigrated to the U.S. believed to be in 1955. My husband remembers seeing the Statue of Liberty as the boat was near the end of it's journey. He also remembers the train ride from the east to California where they settled in El Monte CA. He says a church sponsored his family or group. Both parents have passed. We are quite sure his mom has living family in Hungary and in Romania. She went back to Hungary and visited her remaining relatives. She came back very happy and had a very good feeling about the experience, but shared very little of actual helpful info. We are trying to get a connection with a translator so we can contact people listed in the phone directory with same surnames. I am trying to find about my mother's family. I was born in Loipfering, Germany in 1944. Mother's name: Theres Liebl. She was Catholic I don't know what this means: "Geb. Rg. Nr. 60 Eging." (Eging is a city in Germany). My birth certificate says: International Refugee Organization. Area 7 Legal Consultation Office - Laitpold Caserne Munich. Munchen - Bogenhausen (U.S. zone) Russian Boy Scout troops in camp. Munchen - Feldmoching (U.S. zone) Russian Boy Scout troops in camp. Munchen - Freimann (U.S. zone) Russian Boy Scout troops in camp. Ernst-von Bergmann-Kaserne has its own page.